If you have not noticed (you should now, look to the book list to the left), I have purchased quite a few books on macarons, wanting to learn all the tricks of the trade on how to perfect them. Though I still have a long way to get to perfection, I’m quite satisfied with the end result of these batches of macarons. The shell was perfect, chewy inside and crisp outside. The foot is more profound than my 1st attempt, which is super hard to get right in the first place. I almost broke down in tears of joy! Yes, I was that serious about getting my macarons right! - First, sift the almond flour twice; mix it with the powdered sugar and raspberry powder, and sift 1 more time then refrigerate until called for. - On the back side of 2 parchment papers, trace 2.5cm circles about 2cm apart. Flip them over and line the baking sheets. - Fold the batter with a light hand to prevent bursting the air bubbles. 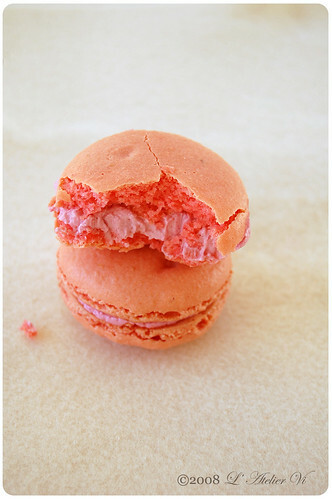 - Press the piping tip on the baking sheet and for uniformly shaped macarons. Do not suspend the tip in the air! In a large dry bowl, whip the egg whites on medium speed until the whites just hold soft peaks and the color turns white. Gradually add the caster sugar, increase the speed to high and continue to whip until meringue holds stiff, glossy peaks. With a rubber spatula, fold half of the meringue into the almond/sugar/raspberry flour mix, fold until incorporated then fold in the remaining meringue, food color and fold until completely incorporated. With the rubber spatula, scoop and spread the batter, in a full circle, on the inside wall of the mixing bowl. Repeat this scoop & spread process also known as macaronnage, 14 more times (exact number of times please). Lift some batter with the spatula, it should falls into the bowl in a ribbon fashion, and has a glossy look; set aside. Fit a piping bag with a 3/8-inch round tip, or take a 12 inches plastic piping bag and snip off one corner. Fill the piping bag and pipe the batter from the center of the drawn circle onto the baking sheets. Pipe about 30 circles. Let dry at room temperature for 20 -30 minutes before baking to allow skins to form. Meanwhile, preheat oven to 400°F/220°C, with racks in upper and lower thirds. Heat the raspberry jam briefly using the microwave, run it through a sieve for a smoother texture; set aside. Cut the butter into ½ inch thick squares, place in a heatproof container and heat in the microwave over medium heat for 10 – 15 seconds, butter should be soft to touch but NOT melted. Using a rubber spatula, mash the butter until smooth and creamy (like the texture of mayonnaise); set aside. In a heatproof container, mix the caster sugar with the water then heat over medium heat in a microwave for 1 minute, stir until sugar completely dissolved. Return it to the microwave and continue to heat for 4 more minutes over medium heat. Remove with CARE out from the microwave and stir with a spoon. Spoon a little bit of the hot syrup into the ice water; it should solidify into a little ball. If it does not, continue to heat in the microwave, 1 minute at a time, until it gets to this state. While the syrup is heating, begin whisking the egg at high speed in the bowl of your mixer using the whisk attachment; whisk until pale and foamy. Reduce the mixer speed to low and begin slowly (very slowly) pouring the syrup down the side of the bowl being very careful not to splatter the syrup into the path of the whisk attachment. Some of the syrup will spin onto the sides of the bowl but don’t worry about this and don’t try to stir it into the mixture as it will harden! Raise the speed to medium-high and continue beating until the egg mixture is thick and satiny and the mixture is cool to the touch (about 5 minutes or so). With the mixer on medium speed, begin adding in two-tablespoon chunks. When all the butter has been incorporated, raise the mixer speed to high and beat until the butter cream is thick and shiny. Add the raspberry jam, crème de framboise and beat for an additional minute or so. Refrigerate the buttercream for 10 minutes before piping. 1. Wait! My buttercream won’t come together! Reheat the buttercream briefly over simmering water for about 5 seconds, stirring with a wooden spoon. Be careful and do not overheat. The mixture will look broken with some liquid at the bottom of the bowl. Return the bowl to the mixer and whip on medium speed just until the cream comes back together. 2. Wait! My buttercream is too soft! Chill the buttercream in the refrigerator for about 10 minutes and rewhip. If that doesn’t work, cream an additional 2-4 Tbsp. of butter in a small bowl– making sure the butter is not as soft as the original amount, so make sure is cool and smooth. On low speed, quickly add the creamed butter to the buttercream, 1 Tbsp. at a time. Pair 2 macarons of similar size, pipe about 1 teaspoon of the filling onto the flat side of one of the macarons then sandwich them. Let them set in room temperature or refrigerate to set. Make 15 sandwiches. If refrigerate, let stand at room temperature at least 2 hours to soften before eating. They are all so beautiful. 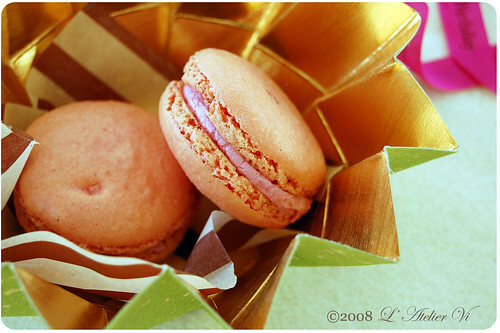 I have to get over my fear of making a macaron. 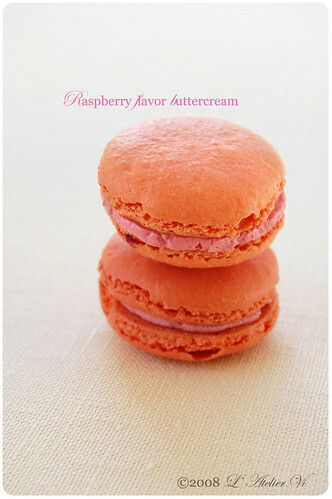 The framboise buttercream sounds heavenly!! Love your blog! J'adore ton blog !!! Il me fait rêver de part tes belles découvertes mais et surtout pour tes magnifiques créations...bravo!! I always like your packaging. I wish I could package something like you do. 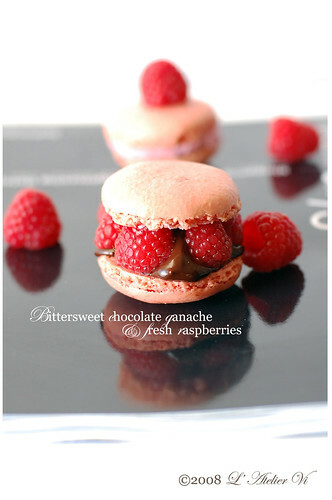 @@"
My macarons are.... still kinda a hit and miss desserts for me. Sigh. @@"
I guess I should be practicing more, but I've been to lazy to grind my own almond powder lately. Hahha.. ^^"
They look so so yummy!!! 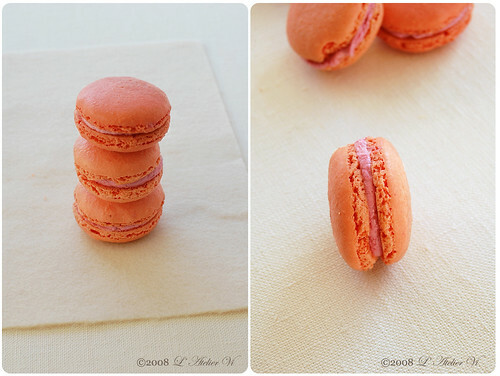 I'm not a baker myself but I heard it's difficult to make the "skirts" around macaron. Good job! I would love this as a birthday present! The packaging and macaroons together are fabulous! Love the bit into macaron. So tastey looking. I have been hooked on them since MArch or so when I first made them. Raspberry powder sounds like something I need to get. These are magnificent! I love their beautiful colors and raspberry is such a wonderful flavor. They look amazing. I had something similar to this in France, stuffed with raspberries and chocolate. I was wanting to recreate it. So thank you. These little jewels can take over the world anytime! 嘩~~~ 正!我覺得你之前做既馬卡龍已經好得! 你仲話今次仲好過之前, 咁...依個咪好不得了!! .. 太好啦! 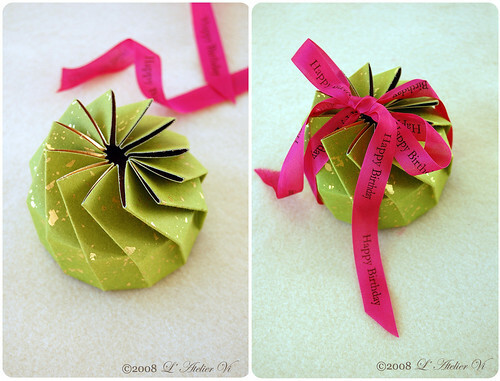 eileen - Thank you =) You got to give this a try! 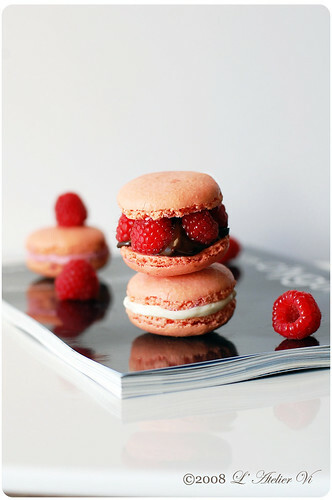 You'll be so happy with your macarons! Lori - Aren't they to die for? Raspberry powder is not readily available in the States but you can make it yourself but grinding dried raspberry pieces into fine powder. They are great for decoration! Manger La Ville - Ooh, parisien macarons, they must been really yummy! I hope this is somewhat close to the one you had in France. Mags - I'm sure your macarons will turn out beautifully when you make them! Can't wait to see them! Yujai - Thank you! How is your wedding? Can't wait to see the pics! J'espère que vous testerez cette recette. Beautiful macarons! Love all the flavors! Hmmmm...whole egg to 全蛋 from the ingredient part was correct. Is the typo within the instruction?